Scottish Stained Glass in Houston designs, manufactures and installs stained and leaded glass windows using the traditional stained glass methods handed down from generation to generation. Most of our stained glass is installed into windows and doors of residential homes in Houston. Over the years, owner Martin Faith has perfected the art of designing and manufacturing stained glass. As you can see from the photos our stained glass is always designed to be perfectly in proportion to the window in which it is being installed and our computer technology helps to ensure that all our products are always manufactured to the exact dimensions of the existing window. The most popular windows to install stained glass into are sidelight and entryway windows along with bathrooms. Privacy can be an issue for many people with clear glass entryway or bathroom windows and the use of stained glass and leaded glass will help prevent unwanted viewing from the outside. Some other great home applications include doors, basements, kitchens, cabinets, hallways, and bedrooms. The options for adding stained glass to your Houston home are endless, and our designers are experts with the many different styles we specialize in. Some of these include our Signature Aspen Collection, Frank Lloyd Wright, Art Deco, Art Nouveau, Mackintosh, and Celtic knots. Our expert team will work with you to find the right piece for your unique home that you’ll love for years to come. 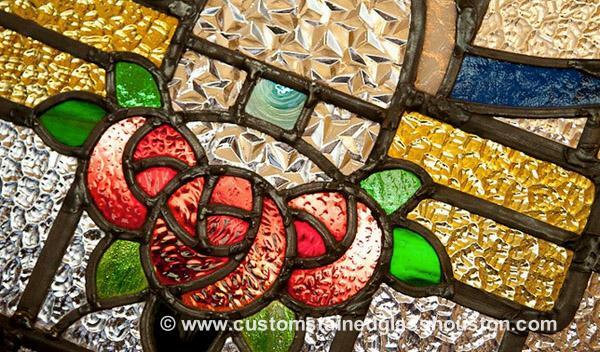 Custom Stained Glass Houston is the regional branch of Scottish Stained Glass. See owner Martin Faith on one of his many Houston and national TV appearances. Questions? Want a Stained Glass Quote?